The calendar is about to flip over to the last month of the year. Sigh. Where has the time gone? It seems as though each year starts out slowly, like a pebble that only moves when you kick it along, but by the end is going so fast, it's like an avalanche that buries you. January is a letdown after all the excitement and activity of December. It's just dull, boring back-to-routine stuff. February - oh, to know the true meaning of February blues you have to live in the Pacific Northwest where we don't see the sun for a whole month. Rain and overcast skies alternate for 28 days, 29 if we're not well behaved. March always tantalizes us with one week of sun when we put on short and t-shirts in 60 degree weather, slather on sunscreen, and are certain that for once summer has come early. But it lies. April is filled with spring showers. That makes it sound like something light and delightful. Nope. Basically more of the same. May starts to look better. The end of the school year is ahead. Summer vacation plans are made. Stores stock bikinis and flip-flops. Even though it's still raining, there's hope and we can dream. June is an agonizing month. Children are still trapped in school and each day seems like an eternity for them. The warm summer days are almost, but not quite, here. In July things pick up speed. The days are full with trips to the Farmer's Markets, travel, camps, reading new books, and just reveling in the sunshine. August goes by even faster. We have to cram in as much summer as we can before the inevitable return of school. Trips to the beach are capped off by back-to-school shopping. September gains momentum. It's a month of readjustment, figuring out new schedules with school, lessons, study dates or play dates with new friends (depending on the age of the child), and trying to cram six new commitments into the old schedule because of the inability to say "no." October goes by so quickly that Halloween creeps up behind you and says "boo!" while you're still trying to make a papier maché Bobba Fett head for your child's costume. November passes by in a blur of holiday planning, anticipation, baking, eating, and shopping. Which brings us to December. Watch out folks, it's going to go by so fast, you'll get whiplash trying to track it. It's the busiest month of the year, and people are always telling us how we can make it busier yet. There are presents to make or buy, wrapping to be done, and packages to be mailed. Then the house needs to be cleaned and decorated for the holidays. If you're not exhausted yet, why not host a holiday get-together? A cookie exchange, a white elephant gift exchange, or an elegant cocktail party? Any or all of those should be easy to squeeze into your free time, right? Am I making you depressed? Anxious? Overwhelmed? I'm going to give you two secrets to surviving the season. 1- A pair of scissors. Just take all of your lists and cut them in half. Do you really need to get gifts for everyone in the extended family? Do you really need to hand make gifts for everyone in the office? Will Great Uncle Bob's next-door neighbor's barber really feel slighted if he doesn't get a card from you? Look at your list and evaluate what's important, what brings joy, and what is most closely tied to the reason for the season. 2- Cookies. I know for some people the baking associated with Christmas is stressful. But for the people like me, the weird, baking-obsessed people, it's an excuse to fire up the oven and perfume the house with the delightful smells of peppermint, gingerbread, and cinnamon. And cookies don't have to be picture perfect, just tasty. You can even invite friends over to bake with you. You'll have more fun rolling, dipping, flattening, and frosting than you would at a stuffy, formal cocktail party. At least, I would. This recipe has a new technique that I love and plan on using again. It incorporates finely grated white chocolate into the batter, and then big chunks of white chocolate are pressed into the top. You might think the chunks are too big - trust me, the kids love them. And the husbands, too. Keep this recipe handy and when it all gets too much for you, take a baking break. 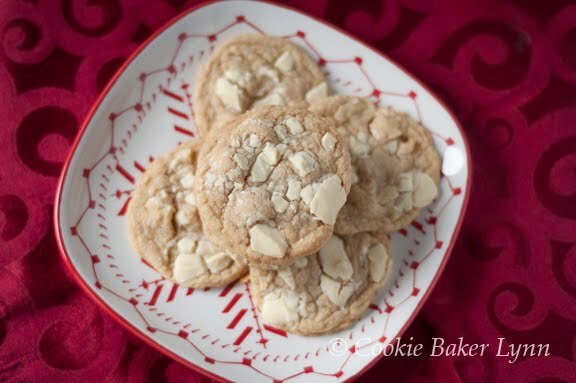 Put on your favorite tunes, warm up the kitchen, and then indulge in a cookie or two. It'll refresh your spirit in no time! 1- Place the butter in a heavy medium-sized saucepan over medium-low heat. Heat until butter boils and bubbles very gently, but steadily. Adjust heat as necessary to prevent butter from burning and continue simmering uncovered for 4 to 5 minutes, or until it is golden but not browned, stirring frequently. Don't burn it! 2- Immediately remove pan from heat and stir in brown sugar. Pour the mixture into a large mixing bowl and refrigerate an hour, or until mixture resolidifies but is not hard. 3- Preheat oven to 350 degrees F with rack in the center of the oven. Prepare several baking sheets with parchment paper..
4- Grate 3 oz. of the white chocolate. Set it aside. Coarsely chop the remaining white chocolate and set it aside, also. 5- In a medium mixing bowl whisk together the flour, baking powder, baking soda, and salt, and set aside. 6- Remove the mixing bowl from the refrigerator and beat the cooled buttero-brown sugar mixture until lightened. Add granulated sugar and beat until fluffy and smooth. Beat in egg and vanilla. Beat in dry ingredients. Add the grated white chocolate and half of the chopped white chocolate, and nuts and stir until well combined. 7- Roll dough into generous 1-1/2 inch balls. Dip the top of each ball into the remaining chopped white chocolate, pressing lightly to imbed some pieces in the dough. Space the balls, chunk-studded side up, about 2o-1/4 inches apart on baking sheets (the cookies will spread as they bake). Press down the top of the balls just slightly with the heel of your hand. 8- Place in the oven and bake for 9 to 11 minutes or until just tinged with brown. Reverse baking sheets from front to back halfway though baking to ensure even browning. Be very careful not to overbake. Remove baking sheets from the oven and let stand for 4 to 5 minutes (the cookies will continue to bake from the heat of the cookie sheet). Transfer cookies to wire racks to cool. Store in an airtight container for 3 to 4 days. Makes about 25 3 to 3-1/4 inch cookies. Lynn - These cookies were awesome! They really were a wonderful treat. Yes, your husband did like the white chocolate in the batter and the big chunks on top. An absolute keeper with this recipe. Am definately going to take that idea of using a scissors to cut my list in half - can I give my baking half of the list to you? White chocolate is my favorite. These look amazing. I love white chocolate in cookies. I think you can add me in with the kids and husbands =) These look great and I agree absolutely with your post! This is a very accurate interpenetration of the year. The only reason why I'm looking forward to January, February, and March is the the cold weather gives me an excuse to bake more. Snow is also a plus, I'm not sure if you get much of that in the Pacific Northwest though. 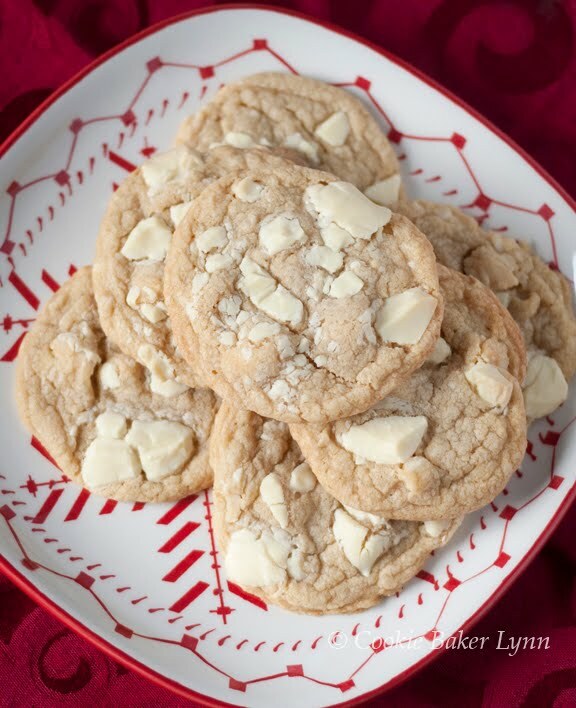 White chocolate and macadamia nuts...a match made in heaven! Love your rendition of the blur of the year racing by. We might have a littlemore sun, but time flies just as swiftly. I vote for baking cookies and forget about the rest! what a thought-provoking post, lynn. i like it. the scissor suggestion is spot-on, and the cookies are divine. You exchange white elephants at Christmas - WOW, I thought Africa was exotic in it's traditions. You're so right about December, we have to cram Summer holidays and Christmas all into one month - rather hectic! Thinking of you during this wonderful time of year. They look delicious and I think I could eat that whole plate full!!! Only good thing about winter is that I can bake more...that's it! You sure summed up the year in short order! I DID cut my list in half! We all agreed...no more cousin and aunt gifts. I love your cookie...crunchy with the nuts and the color made me smile...looks like a winter cookie to me! Great post, very poetic, made me smile :), and although our weather patterns differ slightly and November is a little less busy for me being Canadian, I can definitely relate, as I'm sure most can. 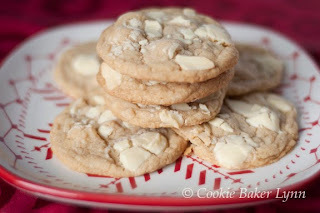 And the recipe sounds fantastic, I'm always looking for good recipes for white chocolate, and this one looks like a win. I'm really considering replacing something on the Christmas baking list for this. I'm just about to hit delete in my entire email inbox and rip up my to do list! I think I need a fresh start as we head closer to the new year! 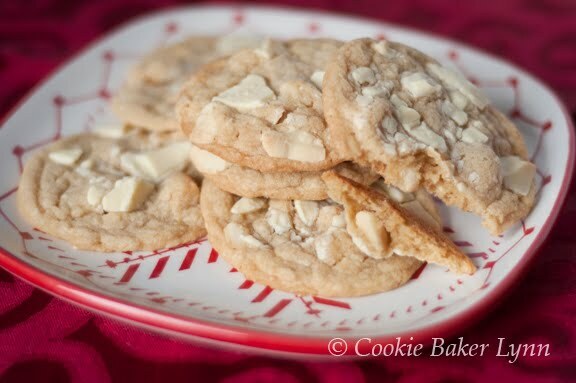 I must say, white chocolate and macadamia nut cookies are my absolute favorite cookies of all time. These look delicious! Those cookies look so pretty with the chunks of white chocolate!! !